This manuscript is known for its copy of the 'Monastic Agreement of the Monks and Nuns of the English Nation' ('Regularis Concordia') and a copy of the Rule of St Benedict. The 'Regularis Concordia', probably written by St Aethelwold (Bishop of Winchester, 963-984) , was part of the 10th-century reform of monasteries which took place under the guidance of Aethelwold, St Dunstan (archbishop of Canterbury, 959-988) and St Oswald (bishop of Worcester and archbishop of York, died 992). Based on the Rule of St Benedict (6th century), which set out the goals and daily activities for monasteries, the 'Monastic Agreement' was issued at a meeting of England's monastic leaders called in 970 by King Edgar. It confirms that the king was the protector of monks and the queen of nuns, linking monasteries to the crown. 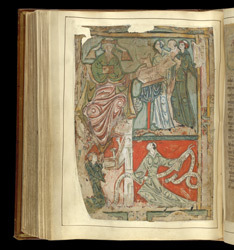 This manuscript, a later, illustrated copy which belonged to Christ Church, Canterbury, also includes prayers, homilies and material on the dramatic rituals of late Anglo-Saxon church services on major feast days. The second of two illustrations in the manuscript, this picture faces the beginning of the Rule of St Benedict. The saint sits facing outward as he opens a manuscript of the Rule which rests upon a cloth-covered stand. Further copies of the rule are held by the group of monks to his left and the one who kneels below Benedict's footstool. In the remaining corner, a monk genuflects energetically with an unfurled scroll--yet another copy of the rule--which swirls about about him. The picture emphasises books and written texts, a response to the reforming drive for elevated learning and literacy.